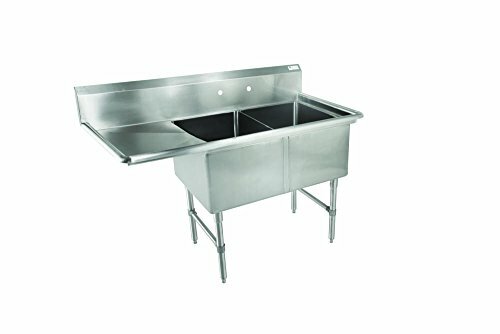 This NSF certified double compartment sink features a 16 gauge 300 series stainless steel bowl and deck. The bowls measure 18" long, 24" wide, 14" deep. Includes front to back adjustable bracing and 2 faucet holes. 18" drain board located on left hand side. Stainless steel legs with adjustable bullet feet are included. Sink measures 58" long and 29.5" wide.